The tomato harvest this year has really blown me away. 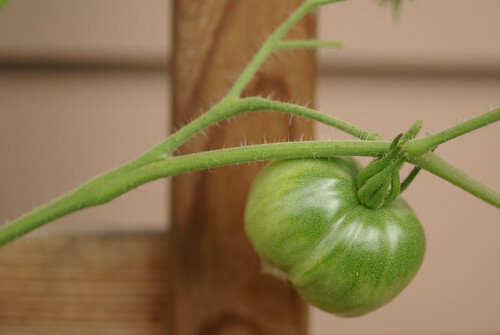 Normally, having just one or two vines in pots on the deck, I’m lucky if I have enough tomatoes to make the occasional salad, or to top a taco now and then. 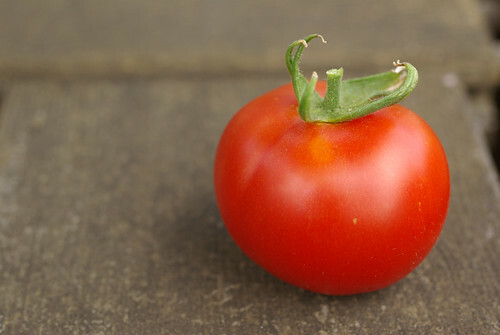 This year the stars aligned to produce showers of juicy little red Stupice tomatoes and bowlfuls of Sungold cherry tomatoes, including the single prettiest tomato I have ever grown. Look, isn’t it beautiful? 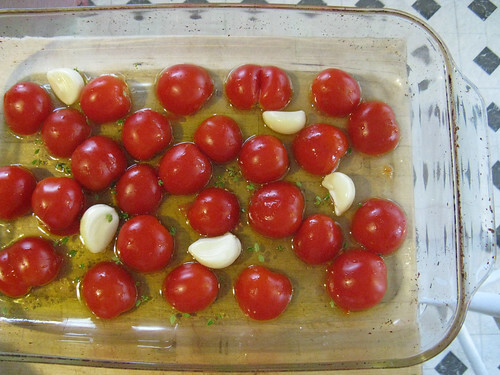 All I needed to do was wash the tomatoes, cut them in half, and lay them cut-side-down in a pan filmed with olive oil. I broke up a head of garlic, peeled the cloves and nestled them amid the tomatoes, then sprinkled fresh thyme branches over the top. The pan went into a 400° oven and immediately the house filled with the scent of roasted garlic. 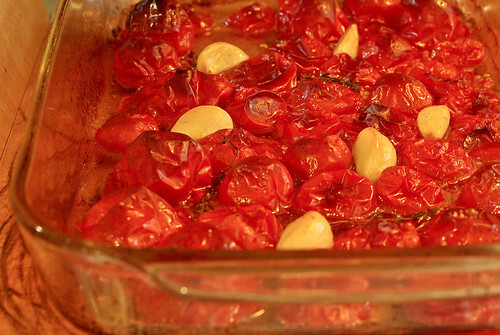 About 45 minutes later I poured out most of the liquid expressed by the tomatoes into a small saucepan, then continued to roast until the garlic was soft and turning golden, and the tomatoes were blistering on top – maybe another twenty minutes or so. I could have roasted them further, but at this stage they were still soft and juicy, but with a nicely deepened flavor. The first time I tried this, I had the brilliant notion of adding canned tuna to the reserved liquid, then mashing the garlic in. Then I tossed the garlicky tuna with the roasted tomatoes and some rotini pasta. That was really, really good, and we will be doing it again. Oh yes. The second time I made this, just a couple of days later, I used it as a topping for a pork tenderloin that Jon seared and roasted. That was pretty good, too, especially when we smeared the garlic cloves over pieces of pork, as if we were buttering toast. 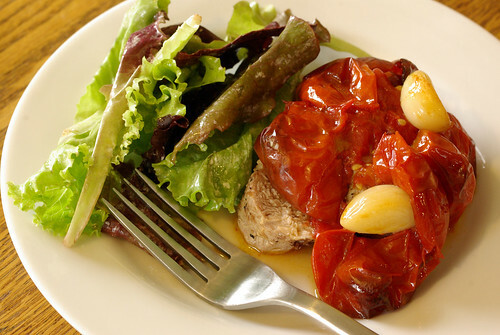 The juices from the tomatoes went beautifully with the soft lettuce salad I served alongside – you could easily make a salad dressing out of them. When I separated the juices from the pan, I followed Peterson’s directions and reduced them, then poured them back in at the end – they end up fantastically infused with garlic. What I’d really like to do is make a pizza with this stuff as the topping – now that would be excellent. I just need to wait for a few more tomatoes to ripen. By the way, this post unintentionally coincided with Tomato Week of the blog event Summer Fest 2009, hosted by Margaret Roach at A Way to Garden. 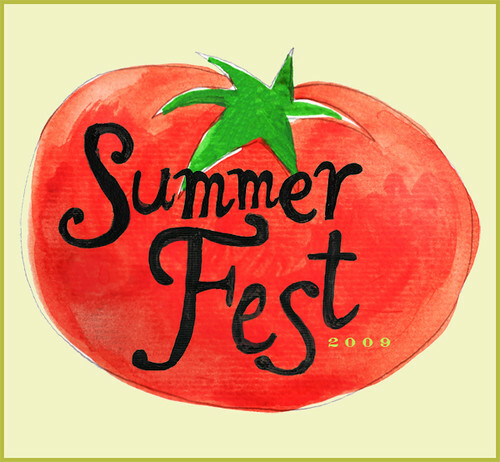 To check out what other people are doing with fresh tomatoes this week, take a look at the participating blogs: Mattbites, Steamy Kitchen, White on Rice Couple, Simmer Till Done, The Sister Project, and Gluten-Free Girl. And feel free to chime in with your own favorite tomato recipes! Seriously, though, this looks fabulous. I used to do something similar with the tons of little tomatoes from our Brooklyn garden. Beautiful! I can just imagine it with pasta. Thank goodness there’s a glut of them at the farmers’ markets. 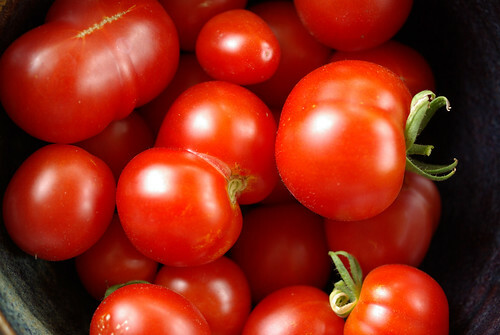 These look like the most delicious oven roasted tomatoes ever. Is there any way you can send me the full recipe? That pretty much was the recipe. It’s highly flexible – give it a try!